Probability can be a cruel and fickle mistress. The free Probability Template is the perfect way to learn more about how probability works, with the simplest example possible. Which way will your coin flip land? This is an age-old question and one that you can learn how to answer using this free template. All you need to do is download and read the guide below to learn how this simple probability problem can be used to solve some of the most complicated problems in life. This template will serve as the ultimate platform to help you learn probability. Start by downloading this free document. All you need to do is click the link located at the bottom of this page. Below, you will notice there are 6 different tabs to use for this template. The first 4 tabs are for calculating 10, 100, 1000, 10,000. 1) Press “F9” to refresh and get different results every time. To use one of the coin flip tabs, simply click the amount of coin flips you want to perform and press the F9 key to recalculate the flips. You will receive a full account of your total flips. 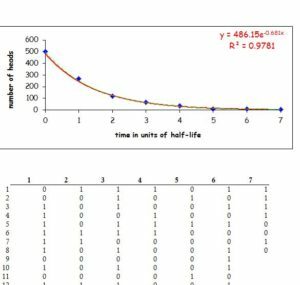 The “Halving” tab is where you will find the isotope half-life calculator, instead. This template page also uses probability, modeled after specific calculations, to give you realistic results. Finally, go to the “Half-Life” tab to display this calculation with graphs and charts. This will help you understand how both concepts work in better depth. This template is the ultimate tool for understanding probability in all its glory. You can easily master these concepts with the free Probability Template at your side. Follow the link below to get started.